Mattel HyperScan is a Intellicard game console system which uses both CD-ROM and RFID technology, combining re-writable Intellicard technology which is used for the first time in the video game and toy industry, with the fast-paced, button-mashing action of video games, making HyperScan a hybrid game machine for both collectible card games and videogames. 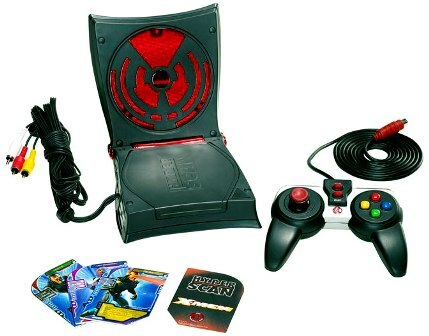 With Mattel HyperScan game console, which is designed for teenagers aged eight and above, players can scan collectible game cards to play, enhance or upgrade game skills, or make the video game characters more powerful ability over time. Beside, statistics are saved permanently to the card for future play. Three game titles will be available at launch, i.e. Marvel X-Men, Cartoon Network’s Ben 10 and Mattel’s Interstellar Wrestling League, with Marvel Heroes follows soon after. BostonHerald (dead link) reviews Mattel HyperScan game console and concludes that usage of IntelliCard technology means stored experience can’t be evaluated by just looking at it, and the collectors game cards are not cheap, and of limited quantity. So, if your kids will settle for a cheap console, you’re probably better off with a previous generation Sony, Nintendo or Microsoft box. If they’re into collectible card games, they’d probably do better with one of the bigger systems.